If you’re basing that on the photo in this thread, the colour looks a bit off to be fair. He should have asked for more !!! Last edited by legin; 1st June 2018 at 14:10. Off to get mine at 3:30. Woohoo - sorry. Looks like a few spots of rain in the dial/ bezel. Did you have to dash inside shortly after that?? Looking great. Not noticed before but the markers look smaller than the current black bay. Is it more akin to the pre maxi dial of the older gmt/ sub etc? This is one good looking watch! I love it! 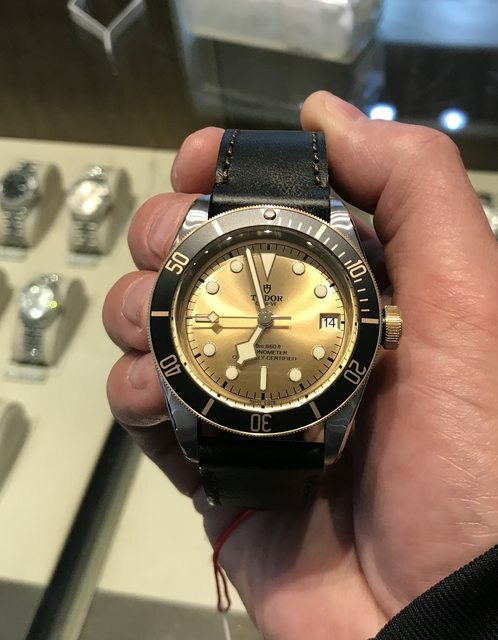 As much as this model is “hot” and new to me I think it is inferior to the Pelagos. The Pelagos is thinner, lighter, more comfortable, has ceramic bezel and is a more complete watch that also comes with a rubber strap which is super comfortable. I think if you sell a Pelagos now once the “newness” hype has died down you will regret it unless you really need the GMT function. The markers were the first thing I noticed too!! May well be a deal breaker for me. i know what you mean but i have always loved the pepsi colours. still my favourite was to be an old seiko 7548 pepsi that i wish i had never sold. i was wondering what on earth that is on the glass of the gmt then i realised its my phone reflection, phew. That’s a good side by side shot...but confirms it for me, I def wouldn’t trade in my Pelagos for one. Plus as mentioned above the small hour makers would be a dealbreaker for me too. Oh I adore the "Lego" indices, one of the reasons why I like my U1 so much. I don't really like MB hands so the snowflake tudor hands are a nice midway point for me. Basically I value legibility very highly, with the blue Pelagos you always know exactly what time it is. But it would be boring if we all liked the same things. That's a whole lot of opinion masquerading as fact. Inferior? How? That's an opinion, but remember that the BB GMT actually has more features, for less money. Lighter? Yes, a little, but for a Ti watch the Pelagos is heavy. Ceramic bezel? Sure, but the Ali insert is also part of the vintage BB feel. More complete? Not sure how to address this, but that is certainly an opinion. And yes, the Pelagos does come with rubber, but at additional cost (significant). 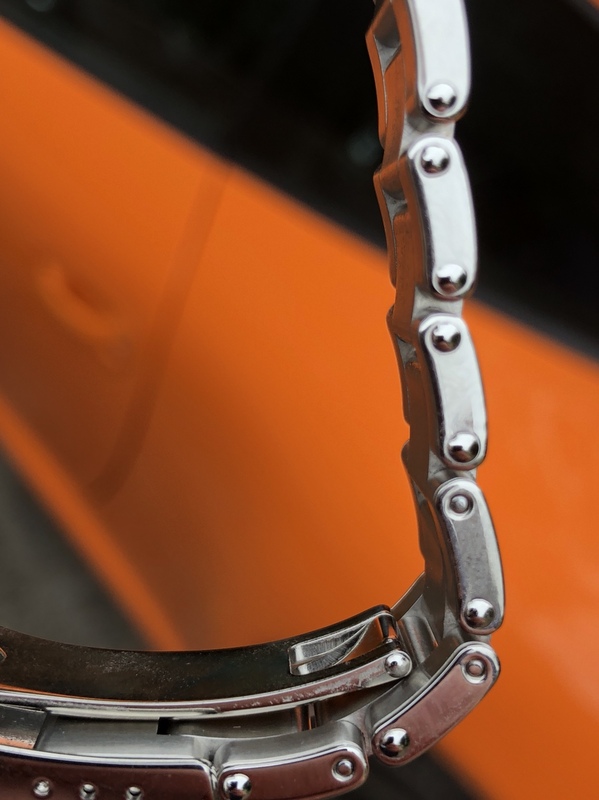 And for many (like me) the rubber remains unused, as I am not a big fan of rubber with metal endlinks. The comfortable bit is also an opinion. Don't get me wrong, I was and remain a Pelagos fan. I love mine, owned over 5 years now. It is an epic design, as I have stated before. But to dismiss the GMT so early on the basis of an opinionated comparison with the Pelagos is silly. Again, in my opinion. One’s a homage to an old Rolex and the other is a contemporary diver. Apples and oranges really. It’s a whole lot of opinion masquerading as opinion. Despite what you say you ultimately agree with me, apart from the “complete” statement, that is it lighter, thinner, has ceramic bezel, rubber strap and more comfortable (due to lower weight). Thank you. 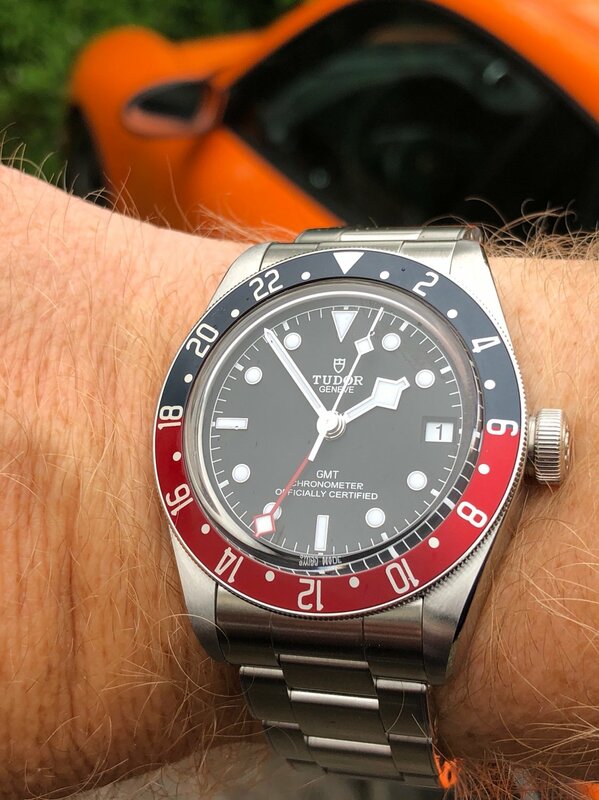 Hardly dismissing the GMT “early” as it is near identical to other BB41 models bar bezel colour, GMT function and hour markers, so in a way it is kind of a known quantity. The traits in the current BB41 which I don’t like are the same in the BB GMT (slab profile, case height and weight) so I don’t have to see one in the flesh to compare it against other models. I agree, completely different. 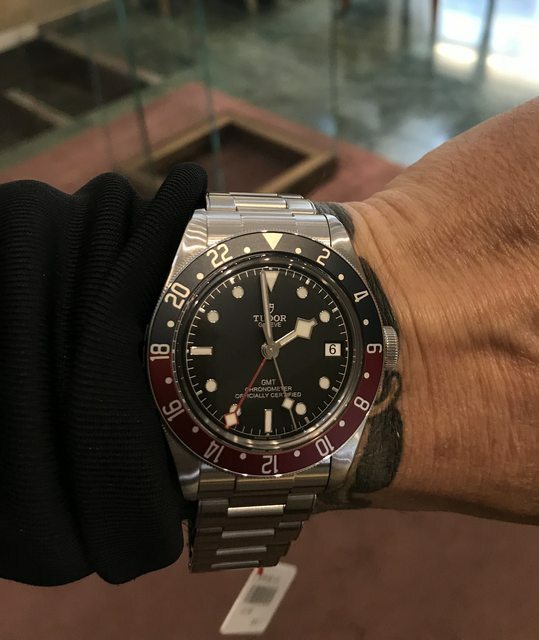 Only stated as jmitch said he’d have to trade his Pelagos in to keep the GMT. I wonder if that one will sell. Last edited by jmitch; 1st June 2018 at 23:52. Yep, I agree. Don’t own the Sinn though so can’t offer an opinion on that. I really am stunned that anyone would pay over RRP for this watch (as nice as it is), then again nothing surprises me anymore. 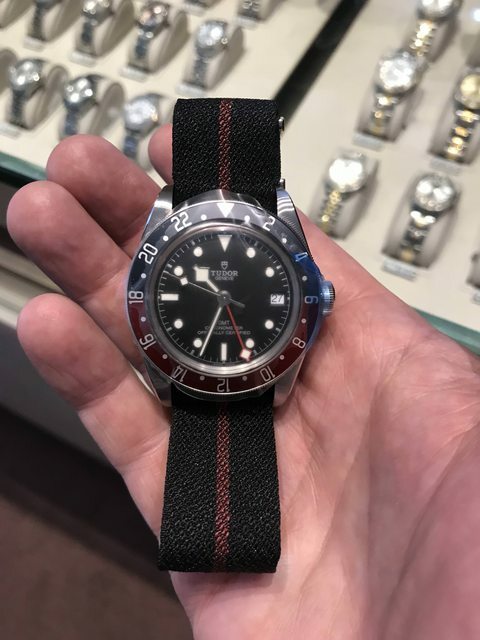 Find it hard to believe there will be a shortage of these, anyone paying over RRP is simply daft tbh, it’s the watch I want more than any as I really like the Tudor quality and the date, gmt function and the coloured bezel makes this my perfect watch. Great to see these filtering through now, I'm looking forward to trying one. Wonder if it’s a cash thing? Certain people who have plenty of cash to spare won’t be able to just go into a shop and buy one. I’m sure they want the latest models too. Have the blue Pelagos and will add the GMT (great side by side by the way) but will not buy into the hype! I'll wait whilst they are all in the windows and try on first. I’m really really loving the gmt . Nice reference for the price and complication. Managed to have a look at a couple of the new GMT's while mooching around Leeds yesterday. Very nice in the flesh, and something i'd definitely like to add to my blossoming Black Bay collection! Was pleasantly surprised to hear the RRP on them as well. Chap said their list was full up to around March of next year, though i can't see these being any different than the Black Bay Bronze, which commanded a hefty premium in its first year or so, and is now in every high street AD's window. Also saw the new Champagne dialled Black Bay. Wasn't so keen when i saw it in print, but in the flesh it works. Last edited by Skip; 3rd June 2018 at 09:51. Did they have the BB58? I kind of expected a call from my AD on one last week after seeing the GMT about. Still not heard of anyone picking up a bb58. Wonder if it will be a much heralded flop? I was quietly hoping as well. Will give them a call in the week. When I picked up the GMT I mentioned the bb58 and was told probably another month. It was the gmt I wanted to see, didn’t as about the 58. Guy was happy to show me all the new arrivals, sure he would have pulled one out if they had it. Are these the same thickness as the normal B.B.? As I sold mine for wearing too thick. Thanks, I did think so but was unsure as legins photo it does look quite slimmer. Oh well guess I’ll have to wait for the 58. Perhaps a flop compared to the GMT. There certainly seems to be less interest compared to the GMT. The BB58 will probably end up only being popular on watch forums, rather than with Joe Public.